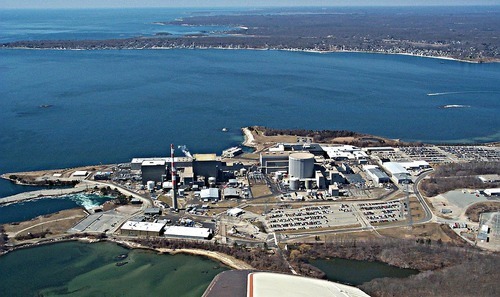 Operators starting up the Millstone Unit 1 reactor in Connecticut on September 1, 1972, had their efforts complicated by a problem with a demineralizer intended to clean up water from the main condenser before sending it to the reactor vessel to be turned into steam. Despite having been only recently placed in service, the demineralizer exhibited signs that its capacity to purify water had been nearly fully consumed. The workers took the troublesome demineralizer out of service and replaced it with another demineralizer. Half an hour later, the second demineralizer exhibited similar signs. The operators began shutting down the reactor. About an hour later, the chloride level of the reactor water increased above maximum allowable limits. The operators scrammed the reactor (i.e., shut it down rapidly). The main condenser was located directly beneath the turbine. Steam entered the main condenser after spinning the turbine blades to rotate the generator and make electricity. The steam is condensed back into water by flowing past thousands of metal tubes containing cool water – in this case, sea water from Long Island Sound. The condensed water collects in the lower region of the main condenser until pumps send it through the demineralizer and back to the reactor vessel to make more steam. As a safety precaution, the pressure of the condensing steam inside the main condenser was kept lower than the pressure of the sea water flowing through the metal cooling tubes. Consequently, if a tube ruptured, outside water would leak into the plant rather than having radioactively contaminated water leak out. The aluminum-brass cooling tubes in the main condenser corroded to the point that many broke, allowing sea water to enter the main condenser and then be pumped to the reactor vessel. En route, the sea water overwhelmed one and then a second demineralizer. Upon reaching the reactor vessel, the sea water damaged all of the local power range monitors (LPRMs). The LPRMs are positioned between fuel bundles in the reactor core to measure the neutron population and provide signals for an automatic scram when the reactor seems to be getting out of control. They also provide input to the plant computer for calculating the power distribution within the reactor core. They are not a good system to have fail in a reactor. During a lengthy outage lasting nearly a year, workers replaced all the LPRMs. Workers also replaced all the aluminum-brass condenser tubes with copper-nickel tubes. It cost a lot to replace the main condenser tubes and the LPRMs at Millstone. But when the tide comes in, it’s not supposed to come all the way in to the reactor. It is amazing how much money is spent on monitoring equipment considering how often the safety flags raised by this equipment are ignored. In this case, the monitoring equipment sensed something unusual in the water going to the reactor. Rather than pursue the cause for this anomaly, workers treated its symptoms by swapping out a demineralizer unit. This futile tactic resulted in less safety and higher cost than had the warning flags been heeded. There have been worse cases. In August 1966, a thermocouple inside the reactor core at the Fermi Unit 1 reactor outside Detroit reported a much higher temperature than other thermocouples. Workers wrote it off as a failed sensor. In October 1966, this “failed” sensor marked the location of fuel meltdown that was caused by a piece of metal blocking the cooling water flow through that region of the reactor core. On the other hand, the partial meltdown at Three Mile Island in March 1979 was caused in large part by operators trusting a water level instrument that was reading falsely high and turning off emergency equipment that had been saving the day. The solution: trust, but verify. Just as good doctors review an array of lab results before diagnosing the reason for patients’ high temperatures, good nuclear plant workers must evaluate as full a picture as possible before discarding an anomalous instrument read-out, or betting the plant on one.